From Magic Shows to Magic Disco’s there is so much to offer for any age. These are very popular and can be adapted to suit any needs and age group. The show has Comedy , Fun , Magic and a very special guest Eric T Crow always brings the house down. During the show boys and girls and even some of the grown ups get a chance to help with the Magic, if it’s a Birthday party the Birthday person has a chance to help and gets a Birthday card from Crazy Corin and Eric T Crow. Fully DBS Checked and Equity member with PLI. These are ideal if you have a hall or large room. We set up a small disco and start with music while the guest arrive then some musical games followed by a Magic Show. After the show we have a break for the food or Cake then More games and Party dances. The Magic Disco’s usually lasts 2 hour. We supply all prizes in with the price. 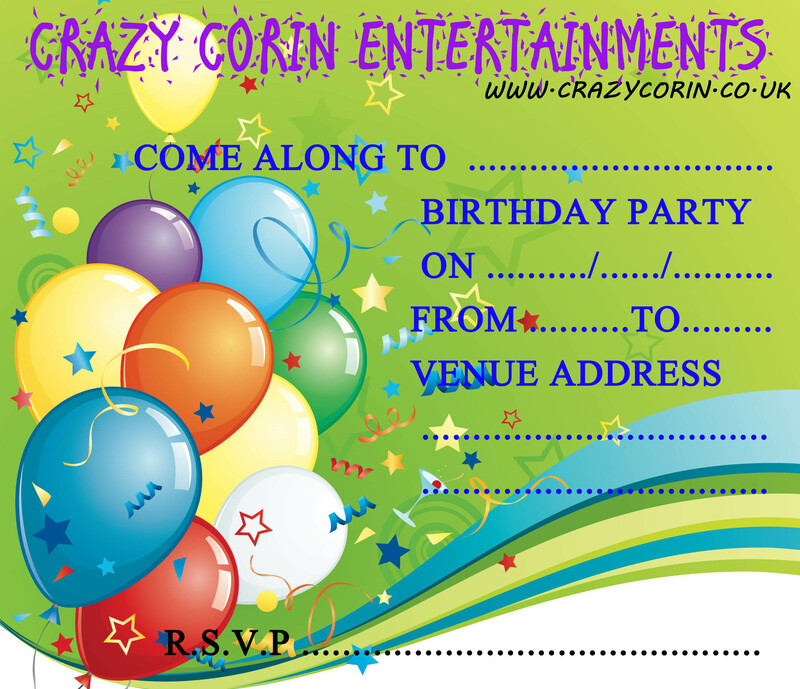 Why not download my brand new invites just right click on image and save then print how many you need. Corin is a full Equity member and has been CRB Checked.